ARE WALKING POLES FOR ME? If you’ve never used walking poles before you may wonder what all the fuss is about. After all you’ve done without them so far haven’t you? Well maybe you have but walking poles are definitely worth considering for any Life’s An Adventure pack free walking experience. What are the features of walking poles? Straps: Walking poles may or may not have a strap. If they do, it is simply to prevent them slipping out of your hands. Grips: These are usually made from foam or cork and some are anatomically designed to fit your hand. Adjustable length: Unless you have a fixed-length walking pole you should be able to adjust the length of your pole with either a twist-lock or a flick-lock. This pole adjustment not only allows you to get the right length for your height you can also adjust the poles for uphill and downhill section and also minimise the poles so you can carry them in or off your day pack when not in use. Tips and baskets: Poles usually have a carbide tip suitable for biting into ice and soft trails, a rubber paw is for use on asphalt or pavement and sand/dirt baskets are used to keep the tips from sinking deep into soft surfaces. To use the poles on pavement, you can remove the baskets and use the rubber paw over the carbide tip. When not in use walking poles can be minimised to hang off your pack. Are you walking on hard surfaces, like roads and stone pavements most of the time? If so then you probably want a model with shock absorption or ‘antishock’ features. 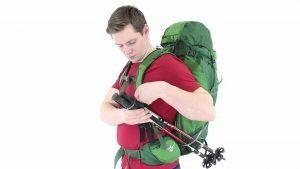 What is your combined body and pack weight? If it is over 90-95kg then you can dismiss all ‘ultralite’ and ‘slimline’ models. Are you using the poles in cold or snowy conditions? If you are, then you might prefer flick locks and not twist locks which are hard to use in gloves. What is the weather normally going to be like? If you’re walking in warm to hot climates then definitely avoid plain rubber or rubber composite grips as they make your hands sweat and callous quickly. Foam grips are probably better for most walking in Australia. Brands of walking poles – Helinox, Leki and Black Diamond. Want to know more about walking poles? Check out this video.